Are you planning an app launch, or is your app already in the app store? If you’re reading this, you’re probably trying to figure out the best strategies and tactics for driving traffic to your app and ultimately driving more downloads of your app. That’s exactly the topic that we’ve discussed in each episode of the App Marketing podcast. App Traffic Academy is one resource for driving more downloads of your app. 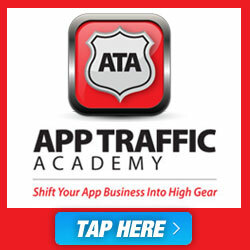 Sign up for App Traffic Academy now. And, let me know if you find the course valuable and helpful. The App Marketing podcast and all the information on this site is designed to give you more information about tactics and strategies for increasing downloads of your app. (Yes, this is an affiliate link, but the App Traffic Academy is designed to give you the information you’re looking for – driving more app downloads).